Want to bring something simple and unique to your next gift exchange? Whether it’s for a white elephant party, an office party or family gathering, bring a gift that represents your style and personality. To give you plenty of inspiration, we compiled 37 fun gift exchange ideas. From earrings to pillows to cupcakes, we have something for everyone. Take a look at the list and see what suits you best! To make your gift decision easy, customize a pilsner glass or design a photo mug. You’ll have a gift that’s both special and practical. Draw a geometric design with pencil on wood or canvas. Paint each shape a different color for artwork that can be hung in a living room or bedroom. Customize your own magnets with various styles of washi tape. Choose patterns like polka dots, stripes or flowers for a whimsical look. Follow our DIY coffee mug tutorial to personalize a mug with a fun saying or pattern. Your friend will love the extra thought you put into their morning routine. Whether it’s for your car keys, chapstick or wallet, an extra clutch is always nice to have around. Fashion one out of leather in a neutral color like grey or brown. For storing items like thumb tacks and loose change, create jars that have a touch of personality. Secure figurine dinosaurs, rhinos or frogs to a mason jar lid, then spray paint it metallic. Make your own tea bags with any type of loose leaf tea, such as chai or peppermint. Form your tea bags out of coffee filters, place the leaves inside, then sew it shut. Repurpose picture frames to make serving trays for beverages and snacks. Line the inside of the frame with beautiful patterned paper for a decorative look. Have a bookworm in your life? Craft bookmarks out of felt. Include a bow, heart or arrow for a personal touch. Stir up your own facial scrub with honey and sugar. Your best friend or mom will enjoy this spa-like treatment. For a holiday cookie exchange, mix a batch of specialty cookies like cherry and chocolate or oatmeal raisin. Place them in gift boxes—and you’ll look like a professional baker! Great for cooking and baking, vanilla extract is best when it’s homemade. With only two ingredients—vanilla beans and alcohol—you can bottle a batch in no time. Form small jewelry dishes out of clay. Add personality with painted polka dots. These little dishes can hold rings, knick knacks and earrings. Knit cozies for coffee cups and travel mugs. Choose a neutral color like grey or white to match any style. With paint or stickers, accent wooden hangers with polka dots or hearts. Add an uplifting phrase for every time someone walks into their closet. Personalize a pillow with a photo, quote or unique design. Make two matching pillows for bedroom or living room decor. Fill a mason jar with the sewing necessities: clothespins, measuring tape, thread and needles. Make the lid a pin cushion for added function. Create a set of stud earrings using enamel and earring posts. Paint them with nail polish in a color like green, blue or pink. The best gift exchange ideas are both practical and unique. Re-purpose a picture frame into an organizer that can house earrings, necklaces and bracelets. Blend together your favorite items like nuts, chocolate and seeds. Package your homemade trail mix in gift bags, boxes or mason jars. Fashion leather pouches with a zipper for storing things like school supplies and makeup. They can easily be tossed in a backpack or overnight bag. Combine simple ingredients to make an all-natural foot soak. This refreshing mixture can be made with lemon, peppermint or lavender. Brighten someone’s day with a healthy treat like homemade fruit snacks. You can make your roll-up with any fruit—from strawberries to peaches. For a new baby, best friend or family member, knit a beanie style hat. Choose a pattern that matches your skill level and enjoy the satisfaction of your beautiful, warm creation. Quirky keychains are an easy gift exchange idea. Attach a dinosaur or animal figurine to a simple key ring, then spray paint it a fun color for a festive touch. These coasters are functional, colorful and make a great handmade gift. Decorate mini cork boards with acrylic paint using stripes, polka dots or zig zag designs. Make an herb garden with mason jars for the culinary fan in your group. Pick herbs like rosemary and parsley from your local garden store and replant them in these sweet personalized mason jars so they fit in any kitchen. Put a twist on the normal brownie with a salted caramel topping. Package your specialty brownies in a gift box for a professional look. Personalize a mason jar with vinyl lettering to add some flair to their everyday pick me up. Make it a tumbler by ensuring the lid has a spot for a straw. Give the gift of relaxation with homemade bath salts. Choose a fragrance like lavender or mint for a spa-like experience. Find tea cups at second hand stores, particularly ones with fun patterns. Turn them into pin cushions for a beautiful additional to any craft table. Enhance a set of wooden utensils with scrapbook paper. Go for a floral look or one with geometric shapes. Yum! Make a batch of rice krispie treats and top them with sprinkles. 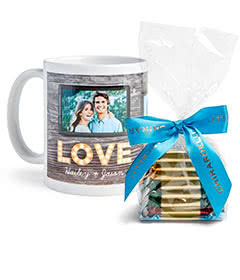 Package them in a gift box and add a tag. Do you have an artistic ability like painting or drawing? Create custom artwork for the kitchen, living room or bathroom. Plant herbs or succulents in a festive pot. Using paint and waterproof stickers, decorate the pot before placing your plant inside. Find a cupcake recipe you love and make a double batch. Add special toppings like whipped frosting and fresh berries. Bring personality to the dining room or living room with personalized coasters. Make yours rustic, modern or vintage themed to fit the style of the recipient’s home. For the world traveler in your squad, gift them something they’ll use time and again. Try a personalized luggage tag and include important information like their contact info, name and address. Next time you’re headed to a holiday party, head into your gift exchange with confidence. Choose a gift from the list above or customize a drawstring bag or tea towel for a personalized gift that is fun and functional.